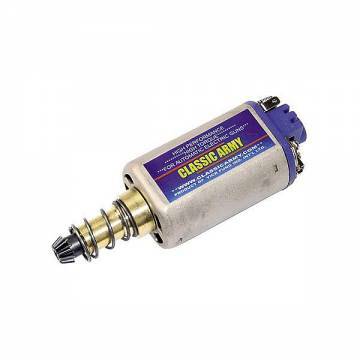 - Performance Motors by Classic Army . - These are high-quality motors available in High Speed or High Torque (long or short) Versions. - Exact replacement for some CA guns. - Upgrade for other manufacturers. - Includes motor and pinion gear. - If you have upgraded and need more power or if you are looking to get insane speed out of your AEG, then take a serious look at the new CA high performance motors. - Super High Speed - Much faster than stock performance and better built. - Use this motor when you have an insane desire to waste BB's. - This will provide you speed junkies with a barrel-melting rate of fire. - Not ideal for heavily upgraded guns. - Super Torque Up - Much more power than stock and built better. - Use this motor when you have upgraded your AEG to the point that it takes a car battery just to get it to turn over.